In Egypt, The High Cost Of Romance Is Crippling Hopes Of Marriage : Parallels Egypt's financial crisis has led to double-digit inflation with lasting repercussions. 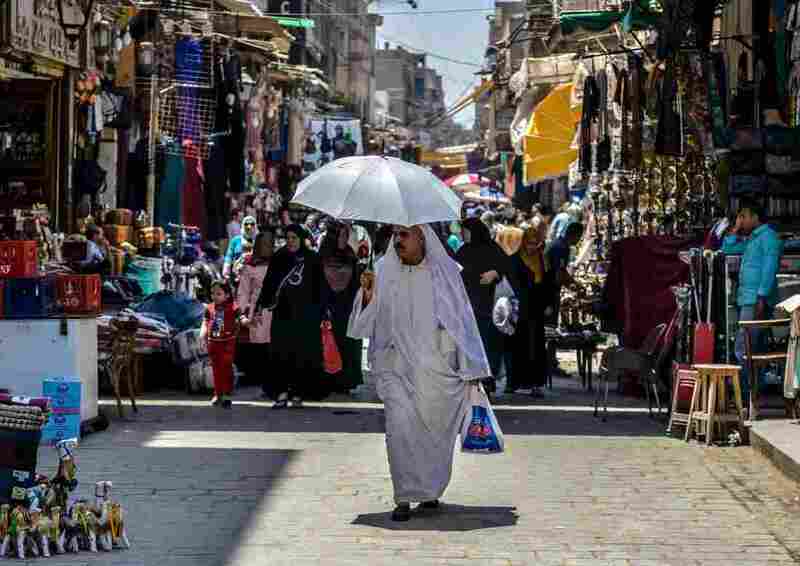 Rising prices make marriage unaffordable for tens of thousands of Egyptians — and not only those who are poor. 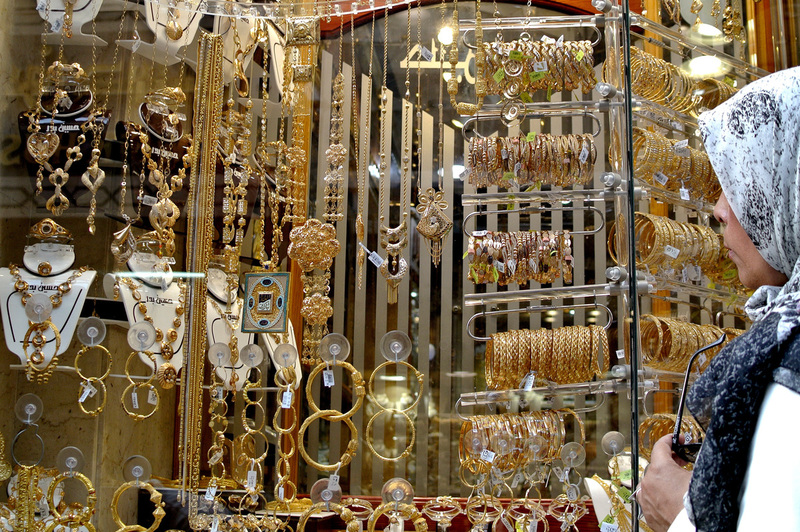 A woman looks at gold jewelry in Cairo's Khan al-Khalili market. Gold jewelry is traditionally given to a bride in Egypt as part of a marriage agreement. 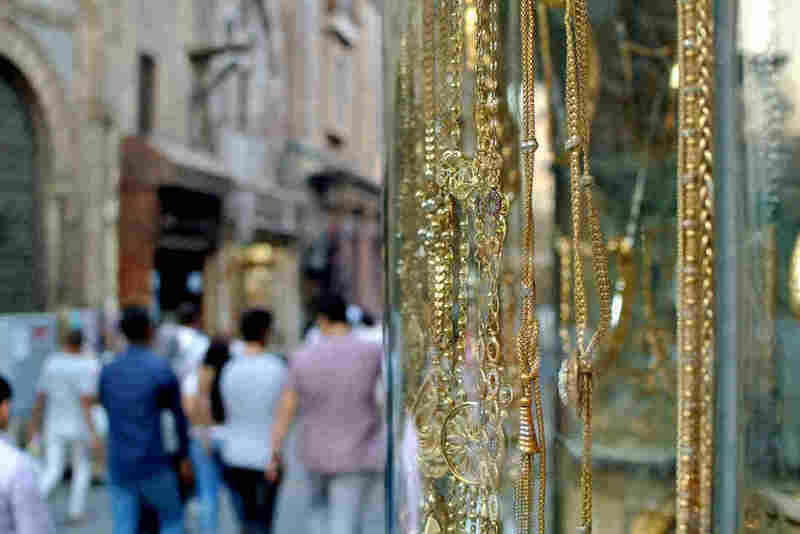 Many young Egyptians have found they can't afford to get married due to the soaring price of gold and rising costs of basic items. In the Shubra al-Kheima neighborhood of Cairo, Sharouk, 20, has had two engagements broken off by her prospective grooms' families. The reason: She couldn't afford to buy kitchen appliances. In Sharouk's working-class community, the groom is responsible for the apartment and furniture, while the bride provides a refrigerator, stove and washing machine. The engagement is sealed with a gift of gold jewelry from the groom to the bride. The soft-spoken young woman has worked in a nearby factory since she was 12. But Sharouk's earnings of about $50 a month are buying less and less. And she is still helping her widowed mother, Samiha, pay off debts from money they borrowed for the marriages of her sister and brother. Egypt's financial crisis has led to double-digit annual inflation, currently running at about 14 percent, and rising prices have made marriage unaffordable for tens of thousands of young Egyptians like Sharouk. It's also blamed for an increase in the divorce rate. Samiha told Sharouk's first suitor, who had already given gold as a sign of good faith, that it would take more than a year for the family to raise enough money for her daughter's marriage. "I asked could he wait for a year or two years to raise the money, and he said no," she says. "So finally, we broke up and gave him back the gold." The engagement requires gold as a sign of good faith — the marriage itself when it happens requires appliances. All marriage negotiations are done through the families — that's why she says "we." The same thing happened with the family of Sharouk's second suitor. "They insist on a fridge and a washing machine and a gas stove. They want a television. They want a freezer," Samiha says. The families parted ways when Sharouk couldn't provide the appliances quickly enough. Samiha says that when she got married decades ago, families were much less demanding. Sharouk, wearing a blue headscarf and a blue cloak with colorful embroidered flowers, bites her nails as her mother talks about the broken engagements. She is so embarrassed she doesn't want her last name used, and makes us promise not to tell her current fiancé, who doesn't know she was previously engaged. Samiha says a refrigerator now costs the equivalent of about $1,300. Even on installments, it would cost more every month than Sharouk's $50 monthly salary. The family has borrowed so much money they can't borrow anymore. Sharouk's current fiancé is from the countryside. He is willing to wait until she can save the money for appliances. When they do get married, she'll have to move from the city to a much different life in rural Egypt. She says she doesn't mind. She is just looking for a man who will respect and protect her. For now, she says if she has any money left over at the end of the month, she buys things to set aside for married life. So far, she's been able to buy only a few items of clothing and plastic dishes for the kitchen. In the family's tiny apartment, a battered fridge is empty except for two small, black plastic bags of tomatoes and peppers. Government cuts in subsidies have increased the price of electricity to 10 percent of Sharouk's monthly salary. Things like fruits or an occasional chicken — food that was affordable just a few months ago — are suddenly out of reach. Most nights, she and her mother have macaroni for dinner. "Everything is expensive — people don't know how to live with these prices," says Samiha. It isn't just the poor who are affected. In Cairo's middle-class neighborhood of Heliopolis, a group of university students play pool in a neighborhood café. One of them, Karim Mohammed, a 20-year-old accounting student, says he recently broke up with the young woman he had hoped to marry because he couldn't afford to propose. "I've loved her for a long time and she loves me," he says. "But she kept saying she wanted me to propose to her. I thought when I start university, I can propose, but even an engagement needs money." The young men say that to get engaged they would need to buy their fiancées at least a heavy gold necklace and earrings as well as an elaborate ring. Mohammed says the 21-karat gold jewelry and even a simple engagement party would have cost more than $3,000. "She kept asking me, 'When are you going to propose?' But I didn't promise her anything, because a real man keeps his promises," he says. Existing marriages are also under strain. At Egypt's Central Agency for Public Mobilization and Statistics, figures show divorce rates have doubled over the past 10 years. The head of population research Amal Fouad says in the past, the reason for most divorces was listed as infidelity or imprisonment. But she says more divorces are now being initiated by women -– partly because husbands are having a harder time supporting their families. "I think," she says, "from my knowledge, the economic reason is the main reason for the marriage dissolution." An earlier version of this story stated that Sharouk's monthly earnings are about $250. They are actually the equivalent of about $50.